Could Arkansas’s New Minimum Wage Increase Poverty? How is the new minimum wage increase going to affect Arkansans? After passing with 68% of the vote in November, the minimum wage will rise to $11 an hour by 2021. Some say it will provide Arkansans with a living wage. Others say it will force businesses to lay off employees. But what does the evidence say? ACRE scholars and researchers have written about the larger effects of the higher minimum wage previously. Concerns about minimum wages include: low-skilled workers suffer the most; employment falls; and the number of hours per worker falls. What is less-agreed upon is the size of these effects. Previous studies looked at minimum wage increases that fall between 37% and 59% of the median wage. The Arkansas minimum wage in 2021 of $11 would be about 74% of the median wage in Arkansas (depending on wage growth over the next few years). 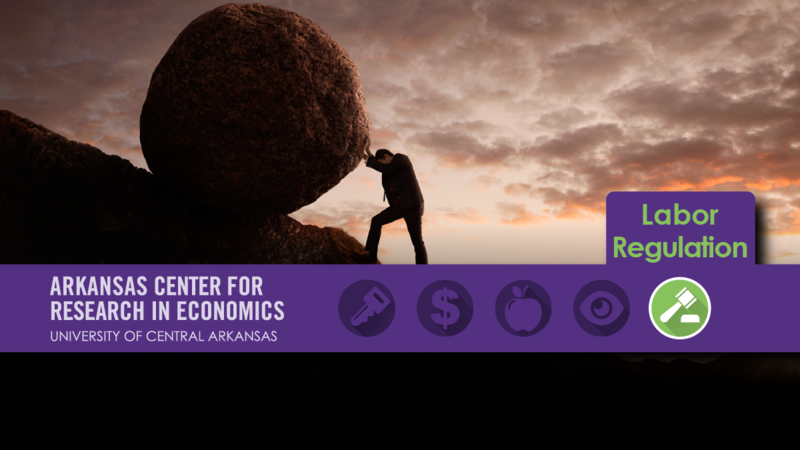 A forthcoming paper, co-authored by UCA Associate Professor of Economics and ACRE Scholar Thomas Snyder, UCA Assistant Professor of Economics Weici Yuan, and UCA alumnus Senayt Rinkevich, looks at a specific question regarding minimum wage increases: Will Arkansas’s minimum wage increase create more welfare dependence? The paper, “Do Minimum Wage Increases Affect SNAP Benefits?”, published online ahead of print by the B.E. Journal of Economic Analysis & Policy, investigates the relationship between minimum wage increases and Supplemental Nutrition Assistance Program (SNAP) participants and benefits. The paper suggests that high minimum wages, such as Arkansas’s, lead to more SNAP participants and expenditure. A high minimum wages may create a barrier for job-seekers because it eliminates low-paying jobs. Employers may not be willing to hire as many employees if they are forced to pay higher wages. This barrier may force some potential workers to depend on SNAP instead of their own income. For a copy of the working paper, please contact Dr. Snyder. To see other blog posts we have written about the minimum wage in Arkansas, go here. For more reading about labor market regulation in Arkansas, go here. To see more of Dr. Snyder’s work with ACRE, go here. To see Dr. Jeremy Horpedahl’s AETN interview on the minimum wage, go here.